I started watching the television series FRIDAY NIGHT LIGHTS last month after Sarah Dessen recommended it in her LJ. I got all caught up on the first season on DVD and I totally love it! I look forward to 9pm on Friday every week so I can see the latest episodes. 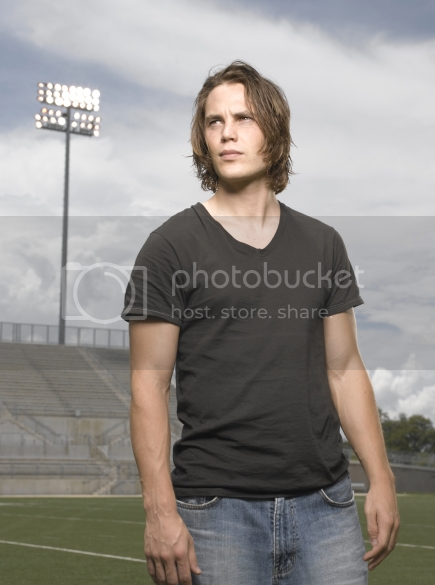 I must confess, the character of Tim Riggins is what drew me in most. He reminds me of a combination of Seth, my main character and of Seth's best friend, Daniel. (I think it breaks down mostly like this: Riggins is like the best of Seth and the worst of Daniel.) And the way he looks is a lot how I've always pictured Seth. Important thing to note: To me, Seth resembles Taylor Kitsch (the actor in the role of Tim Riggins) only when Kitsch is in character. I've seen many photos of Kitsch as a model, Kitsch in other roles, and Kitsch as himself. Those photos do not look like Seth to me. But this one I've posted here does with the exception of the hair which is too long. This is a picture of actress Odette Yustman as Aubrey in the series OCTOBER ROAD. Aubrey does not remind me of Rosetta. In fact, Odette doesn't remind me of Rosetta either. Rosetta is more contrasting with darker hair, lighter skin, and blue eyes. But the features and expression are right. Somehow this photo of Odette/Aubrey captures the closest Rosetta-ness I've ever found outside my imagination.